Partaking in outdoor activities is always fun and for some people it’s a way of getting the most out of life. Those who love being out in nature and going on outdoor adventures know too well that what you are wearing will make or break the experience. Jackets are a must for any sportswoman or sportsman, despite the season, but especially so during autumn and winter, when temperatures drop and the weather gets a little unpredictable. The best way to stay protected under those conditions is having a waterproof jacket, but not just any waterproof jacket. A breathable one is a must. 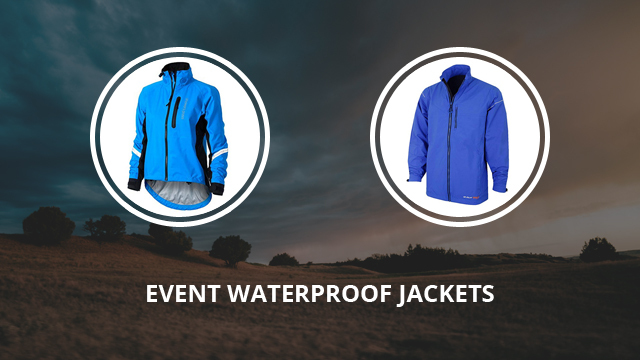 This brings us to eVent jackets, which are waterproof, windproof and highly breathable, due to DirectVenting™. eVent is a fabric technology, which is made of ePTFE as the main material, which then is bonded to other fabrics in order to create a multitude of options for different purpose. These fabrics are not just used for jackets, but other outdoor clothing and shoes as well. We recently took a look at how eVent fabrics compare to the staple of quality waterproof fabric technology, Gore-Tex, which we have frequently included in our selections, reviews and comparisons. We recommend you check that out to get a more in-depth understanding of how eVent works and why it is considered to be the closest alternative to Gore-Tex, while some would even argue that it is the better of the two in terms of breathability. But what you are here for is the jackets we have picked, so let’s get right into it. 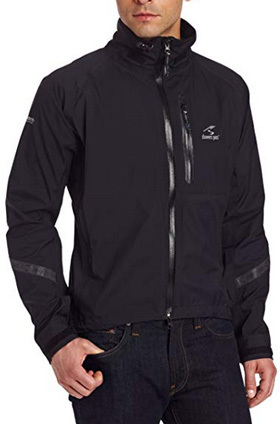 The first three jackets are all by Showers Pass, the first one being Elite 2.1, a waterproof cycling jacket for men. It is made of 100% Nylon on the upper and inner layer, which are part of the Elite 3-Layer rip stop fabrics, in combination with eVent. 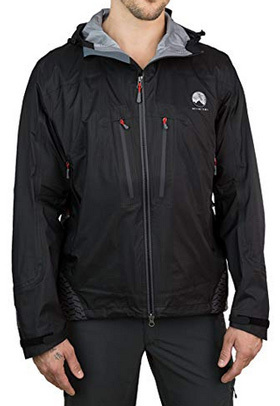 The design is body-mapped, which ensures that the jacket is fully waterproof and windproof all over, while also strategically placing ventilating areas in order to maximize breathability. These vents are located under the armpits, on the back, the cuffs and also including the two-way main zipper. It has an adjustable hem, which comes in a high-low design, in order to keep the back fully protected when you are on the bicycle. There are two side pockets, one chest pocket and one pocket on the back. The sleeve cuffs are adjustable with Velcro fasteners and there are reflective strips on the front and back to keep you safe in bad weather. This jacket comes in four colors: Black, Cayenne red, Goldenrod and Pacific blue. Elite 2.1 for women is also made of 100% Nylon and comes with fully taped seams, which further protect the jacket from the elements. 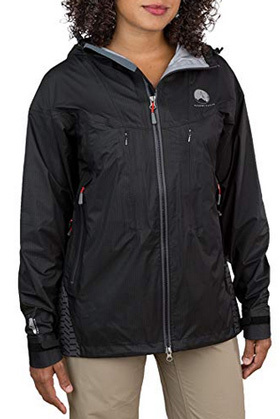 The main zipper is water-resistant and comes with a back storm flap to help prevent water from getting through. The design is very similar to the men’s version, which includes the pit vents and the large back vent. It is a waterproof jacket, highly breathable and with adjustable cuffs and hem, which is designed to keep the back completely covered. To provide safety in dim lights and bad weather there are reflective strips on the sleeves and back. It is available in the colors: Electric rose, Goldenrod, Gold and Pacific blue. The third jacket by Showers Pass is the Elite 2.0 for men. 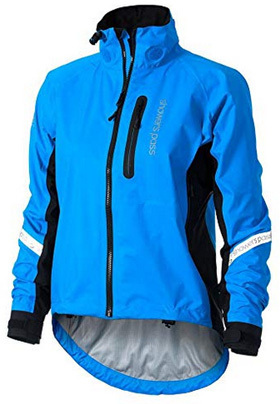 It is made of 100% Nylon on the outer and inner layers, with eVent 3L fabric, which is waterproof, windproof, breathable and very durable to abrasions. It is hoodless and it comes with two side pockets, one chest pocket and one back pocket. 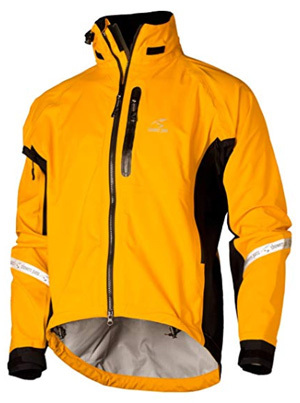 There is a two-way concealed zipper, which is concealed with a reflective strip to keep you visible in bad conditions. Reflective strips are also placed on both sleeves and on the back. For maximum ventilation there are pit vents and a large back vent, including also the adjustable sleeve cuffs. This is a cycling jacket with an adjustable and fully covering back hem, and it is available in the color Black. Moving on to two jackets by Mishmi Takin, the first one of which is the Virunga jacket for men. This jacket is made of eVent 3-Layer fabric, with 100% Nylon Ripstop on the outer part and lined with 100% Polyester on the inside. It is a hard shell jacket, fully water and windproof, designed for a variety of performance sports, such as climbing and skiing. While hard shells are not the best option if you are looking to be as comfortable as possible during exerting activities, Virunga is very breathable and able to wick moisture away instantly, leaving you cool and dry. To further aid with breathability, there are pit vents on both sides and a back vent also. It comes with a hooded high collar, which is adjustable with drawstrings. There are two side pockets and two chest pockets on the outside. It closes up with a two-way YKK Aquaguard Vislon zipper, which is water-resistant. This design is available in the color Pirate black. The second jacket by Mishmi Takin is the women’s version of Virunga, also made of 3-Layer eVent fabric, with 100% Nylon upper and 100% Polyester on the inside. The sleeve cuffs are adjustable with Velcro fasteners and it comes with two large side pockets and two zip pockets on the chest. There are two pit vents and a back one as well. The collar is hooded and high, with adjusting drawstrings on the hood, which is compatible with helmets. The main zipper is YKK Aquaguard Vislon two-way zipper. Just like the men’s version, this jacket is fully waterproof, with a water column rating of 10.000mm and a 26.000 g/m2/24h breathability rating. The color is Pirate black. We are ending today’s selection with a waterproof Golf jacket for men by Stuburt. It is made of eVent 3-Layer, with thermal insulation on the inside for when the temperatures drop. It is a simplistic design, with a stand-up collar, which is hoodless, and adjustable sleeve cuffs. 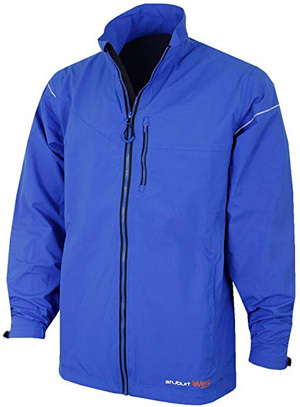 This is a very lightweight jacket, suitable for both low and high agility sports, due to it being very breathable. To provide maximum comfort during movement, the sleeves are designed to be oversized, as well as the body, which makes layering possible during the colder days of winter. To keep you safe in bad lighting and bad weather there are reflective strips on the shoulders. This design is available in the color Imperial blue.